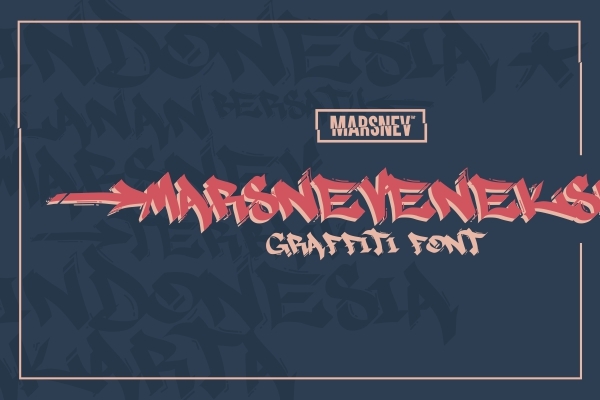 The best graffiti font you can find in town! People might find it hard to spell the name. Here's the clue to spell it: Actually it is formed by three words, which are 'mars', 'neven', and 'eksk'. So it is easier to pronounce when the syllables are separated; Mars-neven-eksk. The last syllable sounds like letter X + letter K.
To be honest, I feel like attached to graffiti. I can say that it is graffiti which brought me to this scene. I fell in love with how bombers modify and decorate letters in graffiti. I tried it myself, and later I tried to explore more than graffiti style. Go download the font here, and tell me about your opinions.